We decided to do some walking around after we finished dinner at Beards Brewery. Petoskey is a tourist lake shore town and there are a ton of cute shops that line the streets. J remembered visiting when she was a kid and getting a Petoskey Stone necklace that she still has. We were sort of looking for one for L but she was more interested in toys and stuffed animals so we just went home with the Petoskey Stones we found at the State Park. The previous day we had drove around downtown a little bit after picking up pizza from Mighty Fine Pizza. J noticed a gelato shop on the edge of downtown and we promised the kids we would stop after dinner if they were good. They were….somewhat good during dinner….so we kept that promise. 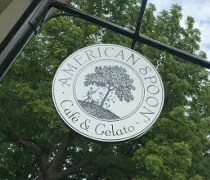 American Spoon Cafe & Gelato is the original American Spoon. There are five locations along the Lake Michigan shoreline. 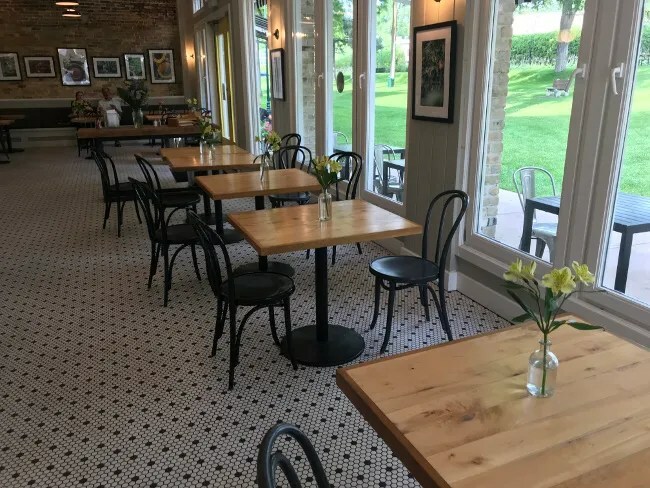 The one in Saugatuck is the closest to us, but there are also stores in Traverse City, Charlevoix, and Harbor Springs. 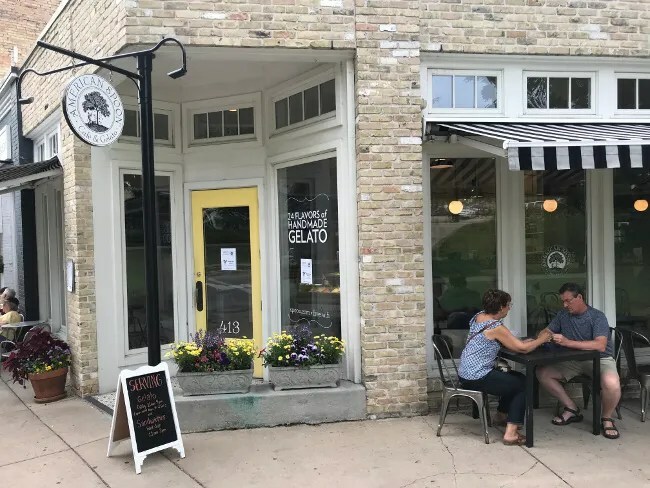 The Petoskey store is the only one with a cafe though although I know the Saugatuck store have gelato. I’ve never been to the other three so not sure if they do as well. The store in Petoskey is actually two stores. One is the market. The space right next to it is the Cafe. Both stores are located on East Lake Street right next to Pennsylvania Park. The gelato counter is right in front of the door when you walk in. There were two guys standing there waiting to dish it out. The flavors are a little unusual. 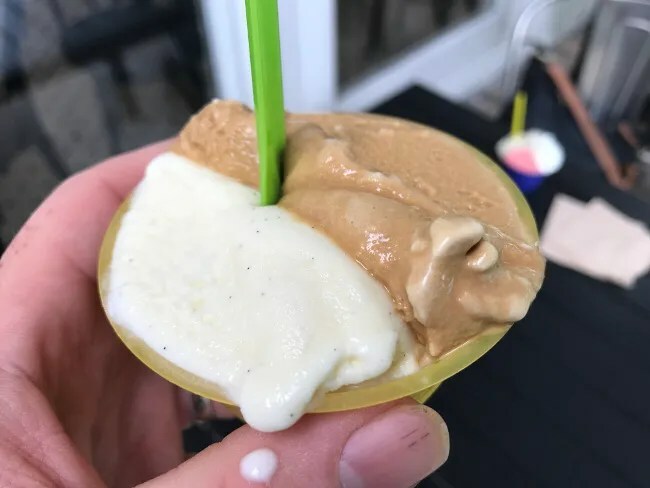 They’re not the typical gelato or ice cream flavors. They’re all pretty unique and really interesting. 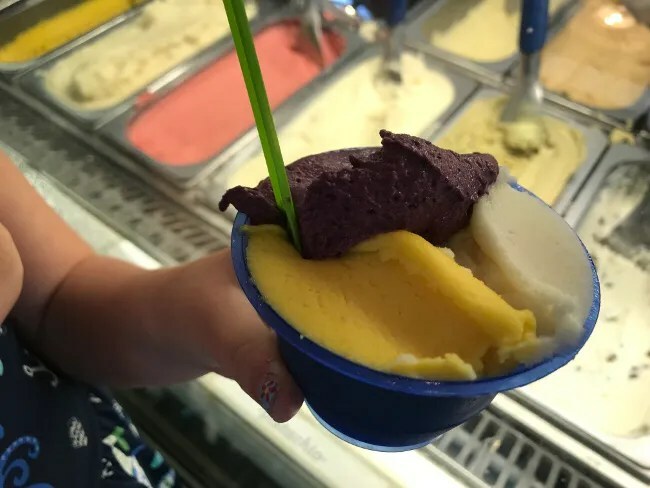 L wanted three scoops and she typically goes by colors rather than flavors. She picked the Michigan Blueberry, lemon, and lime. Three colors is a large, but it’s not really that large. It’s easily eatable for her and she wasted no time putting her gelato away. J also did three different flavors. Not sure what they were though as I wasn’t really paying attention when she ordered for herself. I was still looking at what I wanted. B and I both did smaller cups. 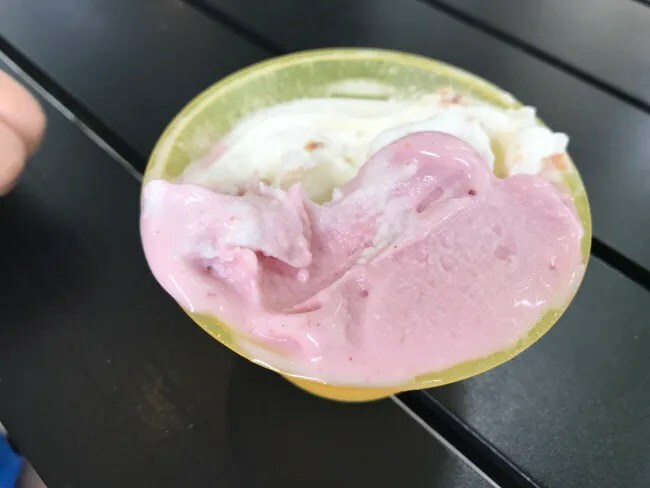 He picked strawberry and vanilla cream. I picked Burnt Caramel and Vanilla Cream. The Burnt Caramel was something. It had a really smokey flavor. The vanilla cream would have been just fine on it’s own but it was quite tasty mixed with the caramel. There’s a pretty large seating area inside, but it was such a gorgeous night out that we went outside and sat at some wrought iron tables on the sidewalk next to the building. Several others were doing that and our kids started to put on a show for the other families eating…so it was time to go. 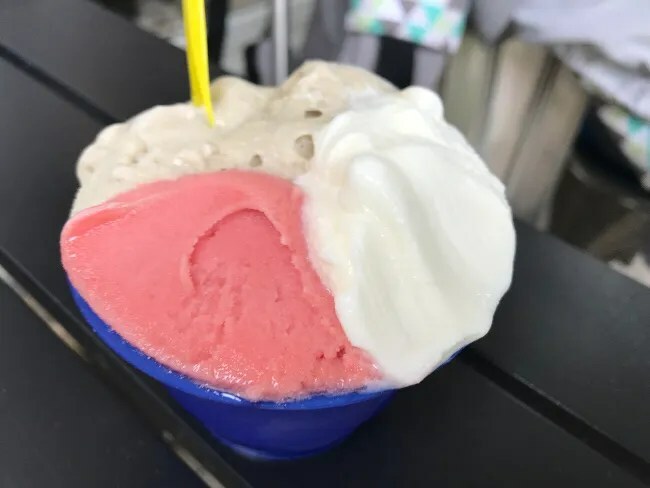 The bill for the four gelato’s was around $15. 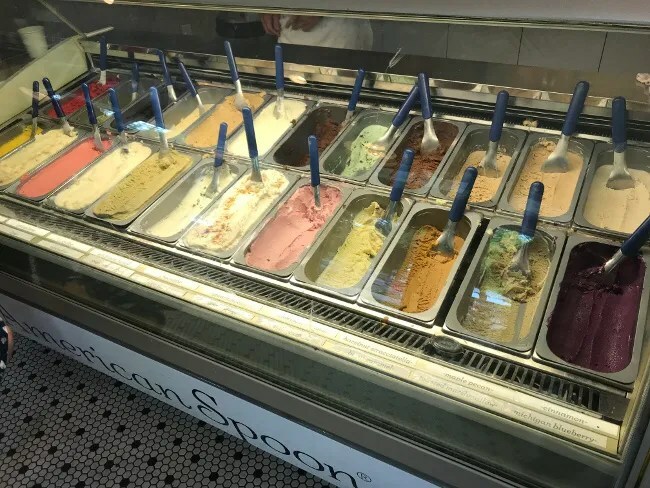 American Spoon Cafe has some really interesting flavors and while I would be happy with simple, it’s nice to see something unique. The kids loved it. J loved it. It was a nice way to end our second night of our Petoskey vacation.